Quietly simmering since March 2005. Ugh. Just found out about the 'Show word verification for comments' feature in the blog settings. Let this be a lesson to other bloggers lest your comments section become a stomping grounds for nigerian princes and "hot" stock tips. I feel so violated. Spammers are the lowest form of life on the planet. Lower than cockroaches and the bio-sludge that collects under your refrigerator. Now that I’ve effectively chased off any readership that I might have heretofore collected by not posting for 6 months, allow me to start fresh. I regret to inform any potentially displaced electrons that the Mental Stew shall be undergoing some ‘Organizational Restructuring’. Thus far into my brief foray of the blogging world, I’ve found that by attempting to combine all of my interests into a single blogspace, I end up self censoring myself far too often. Whenever I come across a juicy topic on which I want to comment, I find myself considering the interests of my audience. Thoughts such as “SoAndSo wouldn’t be interested in that…” end up pre-empting any expository impulse I may have. Why bother the entirety of my vast, ever growing audience, I ask myself, with something that may only be of interest to a small minority? By throwing everything into a single stew, I attempt to please everyone and, naturally, end up pleasing no one. Least of all myself. Apply Topically: Commentary on politics and world events can be found here. Let the amateur punditry begin. TvB: Random geekery of all kinds, but particularly gaming related rants, reviews, and links. Unpopped Kernels: Reviews and thoughts on movies old and new, as well as cinema in general. Heck, maybe even the occaisonal bit of theatre. Tom's Mental Stew: Oh yes, the stew shall still be served, hot and sloppy like I know you like it. Anyway, here is where I’ll keep the more generic, personal items related to my life and what’s new in it. To give you a basic (and completely unnecessary) idea of how this system works, I shall now provide a series of completely self-indulgent and ill-advised examples. If I were to go out and see the film “The Matrix”, I would write up my considered impressions on the finer points of its acting, plot, and cinematography in ‘Unpopped Kernels’. However, if I were to purchase the entire set of posable action figures inspired by The Matrix and then take pictures of them engaged in elaborate reproductions of the movie's fight scenes, I could post all that in “TvB”. I wouldn’t. But I could. On the other hand, if Finland were to declare war on Canada in protest of the fact that Keanu Reeves is a Canadian citizen, my outrage on all things Finnish could be found in “Apply Topically”. Finally, if I had suffered a complete and catastrophic mental breakdown due to my monumental dissapointment with the movie sequels, and my subsequent dissallusionment with the Wazchowskis were to land me in a rubber room, pictures of me in a straight jacket would likely have been posted to the stewpot by a friend or family member. Ah, I can barely contain myself. Tomorrow I head off to the advance polls to do my part in determining which oligarchy shall rule British Columbia for the next 4 years. However, as the election date approached this year, I found myself particularly intrigued not so much by the candidates or the parties, but rather by the concurrent referendum on whether we should adopt a new system of voting known as the Single Transferable Vote (STV). Each constituency now has multiple seats instead of just 1 (each riding has no fewer than 2 seats and no more than 7 seats). Province-wide the number of seats remains the same as before, but the ridings are enlarged to compensate (for example, Vancouver east could be 1 riding with 5 seats. However, a large swath of northwestern BC 50 times bigger could be a single riding with 2 seats. The initial theoretical boundaries seem to be based on population). Voters rank the candidates in order of precedence as to who they would most like to see voted in. You can rank as many or as few people as you like. (For instance, you could rank a member of the Marijuana party 1st, one member of Liberal party 2nd, another Liberal fella 3rd, and a member of the NDP 4th. You wouldn’t, but you could). This is a relatively simple, 2 page document that explains the basic process of vote counting and ranking. Oddly enough, I was directed to the first link by the “Know STV” site, a group who argue against the STV system, but it really helped me wrapped my head around exactly what happens and how. Perhaps they thought that the sheer complexity of it would scare voters away, but for myself it really helped me understand why the system could work out. I’m sure many people won’t care ‘why’ it works so long as it does, but the analyst in me simply has to know the wherefores before I can put my name to it. No risk voting: Quite frankly, I’m sick of voting for the guy who scares me less. This happens in both provincial and federal politics all the time. I’d have to say that right now, I’m not crazy about the idea of voting Liberal federally this time around. Martin hasn’t really wowed me and the whole AdScam thing has taken it’s toll on my patience. But vote for the Conservatives? Not likely. However, using STV, perhaps I could vote NDP, Green, or (brace yourself) even an independent as my first choice, while having a Liberal as my second choice. Finally an end to strategic voting! I could actually vote for someone I want to get in. What a concept. Elections representative of the vote percentage: Under the present First Past the Pole system, you often end up with election results in which one party slaughters the others in terms of seats won, but didn’t really deserve it. Take the last provincial election in which the Liberal party obtained 57% of the vote, but ended up with all but 2 of the 79 available seats. On the flip side, the Green party managed to scrape together a respectable 12.4% of the vote, but didn’t win a single seat. Doesn’t really seem fair. Under STV, however, the combination of increased riding sizes, multiple seats per riding, and the ‘no risk’ factor could theoretically cause the percentage distribution of the vote to somewhat resemble the composition of our elected representatives. Long story short, it’s easier for people to combine voting power that has traditionally been spread out. Minority governments(? ): For exactly the same reasons as the previous point, I’d say it’s a fair bet that with STV we would end up with more minority governments. The more observant readers will note that I’ve put this one in both the positive and negative sections. This is because I’m honestly not sure what the net effect would be of minority governments in BC today. I’ve heard Canadian politics described as a ‘friendly dictatorship’, in which the guy we vote in can basically do whatever the hell he wants for 4 years. Perhaps if coalition governments became the rule rather than the exception, as they are in many parts of the world, we would end up with more balanced decisions. I think I’d cite Israel as a positive example of what a coalition government can achieve. In Israel you can end up with the more extreme rabbinical parties having a direct say in government, but honestly they’d have their influence anyways and at least this way it happens in the full public eye. Fundamentalists are always a bit scary, but they personally scare me less when I can keep an eye on them. The controlling Likud party itself leans fairly heavily to the right, yes, but it does so in a more secular way, and they’re balanced out by strong representation from the centre-left Labour party and several moderate/liberal parties. In a country with so many different voices screaming (and screaming loudly) to be heard, what kind of chaos and dissent would we see without such coalitions? Less local representation: Seeing as we’re enlarging the ridings, it will almost certainly mean less local representation. In fact, you can pretty well guarantee that some fairly large, albeit sparsely populated, regions of the province will have no local MLA elected. By ‘local’ I mean anyone living within 1,000 km of you. We’re a big bloody province. In practice, this means very little to us urbanites living in the more populous regions of the province. Really, unless you happen to be in a cabinet minister’s riding when was the last time your local MLA had any influence on provincial policy? But for rural BC, it might make the more out of the way regions just that much easier to ignore. Overall, I would have to say that there is some risk to rural BC. Specialty groups: This is the uglier side of combining voter power. For every Green candidate, you have a Marijuana party lobbyist. I’ve nothing really against the Marijuana party or their platform in particular, but I do object to electing single-issue candidates who will spend the next 4 years harping on a single topic with no real interest in governing the province. Think a provincial version of the Bloc Quebecois ;). Minority governments(? ): And here we have the nasty side of coalitions and minorities. A valid objection to minority governments is that in the worst case scenarios, no real change can ever be implemented, as no one party with a clear vision is ever strong enough to put that vision into place. Moreover, instability of government can also hurt the economic well being of a region. I suppose I’d use Italy as a negative example of the kind of catharsis that can occur with minorities and coalition governments. Between 1945 and 1993, Italy had no fewer than 52 governments, most of which lasted less than a year. Certainly not encouraging, but then Italy is a very fragmented country. Hopefully this didn’t turn into too much of a rant, but in any case, assessing the good and the bad, I think I’m throwing my vote towards the ‘Yes’ side. I find the system at present to be profoundly dissatisfying and I think the risks are worth it to see some change. Oh and for those wondering why I’m not simply waiting until May 17th like the rest of the province to vote, Flo and I will be heading off on a cruise to Alaska next week for some much needed vacation. Many pictures to come of the scenic inside passage and the dwindling icebergs of the North. After nearly two years of dithering about, I finally took the plunge this weekend and bought myself a brand, spanking new bicycle. For the past month or so I've been spending seriously hunting around town on the weekends and after slogging through a host of stores that were either too big or too small, staffed with folks that were either unknowledgeable, unhelpful, or just plain odd, I finally found myself at Caps. I think the last time I was there I was around 10 years old, back when I was more interested in BMXs than mountain bikes, and so I can perhaps be forgiven for not recalling straight off just how good they were. I think this was just about the only place I had been to all month where anyone had actually bothered to perform an actual needs analysis. Within 10 minutes of my arrival, I had managed to find someone who could give me real advice, supplied a range of choices, and even offered his own balanced recommendation. The prices were even better than I had found elsewhere. If you live anywhere near the Lower Mainland, skip yourself a world of hurt and just go here. It's located in an out of the way portion of New Westminster, which is bad in that it's inconveniently located, but good in that you don't have to hire an armed guard to accompany you from the distance between your car and the shop. Anyone acquainted with the Londsdale Quay region will know what I'm talking about. I confess, I went a bit nuts on the accessories. Although my 33 liter Sakaroo(TM) paniers ARE in fact constructed entirely of 600 Deniers Polyester With PVC Coating To Increase Water Resistance and could probably stop a bullet, $75 was a bit much to spend compared to the half-priced nylon packs that held a good third more. But these just look so darned cool... and they have high molecular weight polyethylene plates... and there was a kangaroo on the front. I'm such a consumer whore. As I excitedly bounded about the house in childlike glee over my new toy, my wife presciently sensed that I was likely to do damage to the house if I didn't find a way to work off my exuberance and so wisely suggested that I go out for a ride. And so, forgoing the bottle of champagne for fear of scratching the paint, on Sunday afternoon I launched my sparkling new Trek 4300 on her maiden voyage. And a beautiful day it was for cycling, being as it was a warmer than usual Vancouver spring afternoon with barely a cloud in the sky. I quickly suited up and charged off down Broadway. Lemme tell ya, they've done some amazing things with bicycles in the 12 years since my last purchase. This sucker flies. What with it being constructed entirely of Alpha Aluminum (which, as we all know, is infinitely superior to Beta or Gamma aluminum), it doesn't weigh 10 pounds. A good bloody thing too, as I quickly discovered that over the course of two years in drydock, my quads had managed to atrophy into what amounted to two withered bananas. Still, I immediately felt my purchase validated as I steadily trundled alongside an 18 wheeler, managing to match it's pace for about 6 city blocks. On a busy day in the city, riding a bike really is only marginally slower than driving. Seeing as the one bicycling accessory I hadn't yet purchased was some sort of security device, the maiden destination in question was the local hardware store. Now see, the reason I was in the market for a new bike at all was because my previous item had been stolen. I do claim partial responsibility for this. Having little room in our townhouse to store large leisure equipment, I made the monumentally stupid decision to lock up my bike on our ground-floor patio with only a simple cable lock (known to Vancouver's finest as "Gift Wrapping") for 'protection'. So I wasn't about to mess around this time. Following the example of my brother in law, I picked up a 9 foot length of steel chain and one of the biggest, baddest padlocks I could find. Notwithstanding the difficulties of hauling 30 pounds of metal back to my place (thank god for those 600 Deniers), I felt satisfied with the end result after securing my bike for the night. 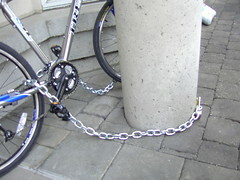 If they can get past the chain, the padlock, and the cement pillar, they can have what's left of the bike. It's not often I take to l33t speak, but this link calls for it. Someone out there put together a great 'interpretation' of the Star Wars: Episode 3 trailer, using the original video/audio but inserting their own subtitles. If you're a gamer, or simply up on your Internet and gamer jargon, I'm sure you'll find it entertaining. If, on the other hand, you are presently wondering why anybody would ever intentionally type the characters 'L', '3', '3', and 'T' together in sequence, this may not be for you. I sincerely hope it r0xxers j0re b0xx3rz. P.S. Please mentally wish me luck, I'm doing the Vancouver Sun Run tomorrow and I've barely trained at all this year. I'll probably blog about it tomorrow, so long as the lactic acid build up in my legs doesn't find its way to my fingers. What IS midnight oil anyways? So many things have happened in the world over the past few weeks, so little time to write about them... Sadly, instead of doing something constructive like blogging, I've been chained to a desk, huddled in a dark 6' x 6' blue box with only the glow of an old image-burned CRT monitor for warmth, forced to churn out prototype user interfaces and design documents in the pitiful hopes of obtaining the carrot or two my captors would routinely, nay systematically, dangle before my eyes. Unfortunately, the floors were concrete and the guards checked on me daily, so tunneling was out. Only the vague hope of a better life some time in future and the distant memories of my previously joyous life kept me going. But I exaggerate. I don't mind doing a bit of overtime, but I do think that 15 hours in a week is a little excessive. Luckily my wife is well acquainted with the joys of working for a software company and so was quite understanding about the whole arrangement, but even she couldn't resist a touch of wry humour. A few nights ago, about a week and a half into my irregular hours, after coming home at about a quarter after 11:00 pm I began to tiredly regail her with the completely uncompelling tale of the days events and the circumstances resulting in my lateness. She listened attentively, saying nothing, until a break in my tirade offered her the opportunity to quaveringly enquire, doe eyes wide in mock fear, "Who are you?". Still, I should be grateful. My hours aren't as bad as some of those who work for other software companies in Vancouver, and it has been implied that I may even be receiving financial compensation for the extra time. The work I’ve been doing has even been fairly interesting, although I would have appreciated a little more time. A good man loved by millions, the only one in his post that I have ever known, passed on. Sad, but nobody can say that it wasn't his time, and perhaps his successor will be even more progressive than he was. Here's to hoping. Our federal government's lackadaisical attitude towards protecting Canadians abroad continues to worry me with their repetitive shoulder shrugging over the torturing to death of one of their citizens, but that's okay because I suppose they have a lot on their minds what with it being exposed that they're a load of corrupt bastards (not much of a revelation, I know). And the only likely alternative to the graft and corruption that comes with a party who has been in power for over a decade, and whose leader has all the decisive, single-minded determination of a wet sponge, is to elect a fellow for whom conviction and focus is certainly no problem, but whose fundamental vision for the country differs greatly from mine. Put bluntly, he is one scary sonofabitch. Seriously, you could bend spoons with that expression. Ah hell, maybe I'll forgo 'strategic' voting altogether and just vote Green or NDP. The way Layton conducts himself in front of crowds always reminds me of a marionette, what with his wooden movements and perma-smile, and he tends to spend too much time spouting empty party lines, but at least I can get behind most of the party platform. It isn't often that I feel out of touch with the world, mostly because my particular generation has only just reached the point where there is anyone around old enough to scratch out a gap wide enough to tumble into. But today I had the chance to visit my old university, SFU. Wow. At first glance, things seemed much the same. The main campus sprawl still consisted of an artful scattering of concrete blocks, lent the odd splash of colour by an activist's poster or two. The fountain by the Main Mall was still a filthy disgrace with tiles missing, incomprehensible art pieces from our Fine Arts department still confounded the casual passersby, and the fish pond had accumulated its regular winter coat of algae, scum, and concentrated neglect. Ah, memories. They ran deep for this humble, but respectable institution. However, this initial familiarity only served to make my subsequent discoveries that much more jarring. My wife, a grad student, had futilely warned me that I'd be surprised at the changes. Mentally shrugging, I figured that there would be a few new residence complexes, rumours of which even I had managed to pick up on. But as I crested the last hill leading up to the main bus loop, 'surprise' isn't quite the word for my reaction. 'Surreal disbelief' comes a bit closer. Where before there had been nothing but trees and the lake of pavement and steel that was Parking Lot B, now stood the beginnings of a commercial district reminiscent of Whistler Village. A babbling, and sparkling clean I might add, stonework fountain system heralded the entrance to the Renaissance Coffee bar, where even now I sit as I write this, munching on the best scone I've had in years. Any fellow alumni happening upon this entry will undoubtedly be a bit perplexed by this last statement. "Renaissance Coffee?" one might query. "When I went to SFU, Renaissance Coffee was an unpresumptuous little stand that hawked beverages deep inside the bowels of the Academic Quadrangle. The only way to be 'inside' Renaissance Coffee would be if you were the one or two people who worked there." No longer, my fellow gappees. Now it's a trendy little Bread Gardenesque cafe with a full kitchen, leather chairs, a fake fireplace, and a plasma television screen on the wall. And this is just the beginning. A little haven of yuppiedom extends from this point on for about a city block, its outermost tendrils hungrily eyeing the nearby wilderness. Within, shops selling everything from fine cuts of meat, to baked goods, to medical services nestle beneath a 3 story high apartment complex. Now this may not sound like much to people from schools couched in actual cities, and in fact it really isn't all that much. But to the hermit kingdom that is SFU, a school who redefined the term "ivory tower" by placing itself atop a mountain, this is a huge step. I mean geez, during my very last semester up there I remember it being a big deal that we were getting a Mr. Sub on campus. More than the changes themselves, I think what most surprised me was what they signified. My old Uni, which for the 6 years of my attendance had stood cryogenically frozen, had Changed. And it didn't even ask me first. I must confess though, the part of my ego that has gotten over the shock has done so by graduating to feelings of jealousy. Where was all this when I went here??? Hell, if we had had even a grocery store up on the hill, I might have considered living on res during my degree. Now the school has its own butchers and real-estate agents (a fortuitous pairing, no?) Just around the corner from Renaissance, I see that a new pub is even in the works. In my mind's eye, I can already see our dedicated undergrads diligently working their way through a pint of microbrew while pretending to discuss their coursework, after which they can stumble 'round the corner to their apartments a mere half a block away. There was nothing up here: No really, I mean it. Nuh-thing. A company named Chartwells, which as near as my memory recalls is an organization that makes its living by passing off styrofoam recycling plants as student cafeterias, had a nearly exclusive contract to provide food to the University, and they profiteered until the very stones of mountain itself gave blood. The only place to get a drink was the student run Highland Pub, where the food was decent, but the atmosphere a bit too relaxed. The employees, while nice, tended to glare at you a little resentfully when you politely inquired as to whether they were done killing the cow so that they could kindly hurry up and finish cooking your damned burger sometime before the end of the semester. It is in the middle of nowhere: SFU is a superb school with great courses, an amazing collection of profs who treat their students as fellow human beings, and a view of Burrard Inlet that is to die for. But it's on the top of a fricking mountain. Without ownership of a car, the possibility of staying up here past 6 is a little disconcerting. Most students trundle up the hill for their classes and roll straight back down afterwards, with a predictability envied by pendulums. The slightest indication of snowfall generally sends students scattering for fear of becoming trapped and forced to resort to cannibalism (Not to be confused with Cannabissism, a practice which flourishes among those brave few who actually do live on campus. Given the bleak surroundings in which they subsist, this is perhaps unsurprising.). Problem number 1 seems like it may be on its way out. Problem number 2 is a little stickier, mountains being the immovable objects that they are, but then the situation has already been improved a little by the placing of a monorail terminal at the foot of the hill. Ironically enough, this terminal opened the very semseter after I stopped going there. Oh cruel fate, why do you mock me. In sum: Glad to see things changing for what appears to be the better. Bitter that the changes didn't happen while I could take advantage of them. Maybe this is fate's way of rapping my knuckles for not continuing on to grad school.